Check whether your question is on the FAQs page. If it isn’t, please feel free to send an email to theinvisiblescar@gmail.com. Check out this post about how attribution should be done. Email theinvisiblescar@gmail.com and put QUERY in the subject line, so I can easily find your message. Please note I’m not a psychologist or therapist. If you send me a long email about your personal situation and ask for professional advice, I’ll advise you to get professional help. The right therapists have the expertise, insight, and experience to help you on your road to an emotionally healthier life. 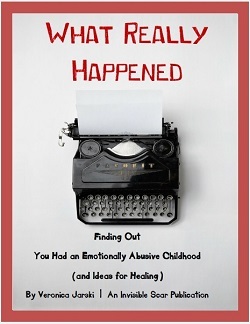 Getting therapy is a must for an adult survivor of emotional child abuse. Don’t put it off. Veronica Jarski is the founder and writer of The Invisible Scar. She has extensive editorial experience in marketing and education, and a bachelor’s degree in journalism. Veronica currently works full-time as a communications writer for a wireless technologies company. Please note: I may use your question (but never your name!) for a From the Editor’s Mailbox article here at The Invisible Scar.